Carrot and daikon thick soup (hong bak lo bak guern 紅白蘿蔔羹) is quick and simple with few ingredients, nice steaming hot or warm. Perfect for lunch or light meal. This recipe makes 3 large bowls of soup. Mix minced pork or beef with marinade. Leave aside for 15 - 20 minutes. Put stock, daikon and carrot into a saucepan, cover and simmer for about 20 - 25 minutes till carrot and daikon are tender. Add meat. 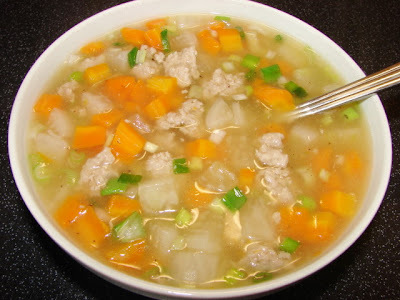 Use a spoon scoop tiny bit of meat into the hot soup to form tiny meatballs before adding to soup. Simmer for a little while till pork/beef is cooked. Season with salt and pepper. Add in slackened cornflour to thicken. Stir in sesame oil and spring onion.